A second visit to this mountain, the highest in northern Germany. It was really a spontaneous idea to climb the mountain again (I had been to the top in the spring of 2008), because I was in nearby Braunschweig vor a work-related meeting, and on my way back to Goettingen where I was to spend another night at Martin Potthoff's house, I drove pretty much right passed the mountain. When I left Braunschweig at 3pm, the weather was beautiful, and I was hoping that I would at least see the top of the mountain. 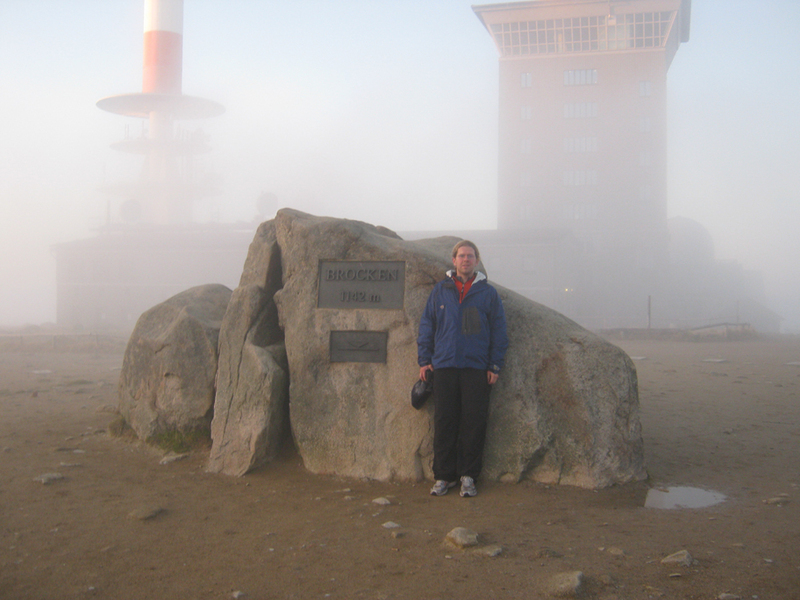 An sure enough, 20 minutes later I could see the antennas that mark the summit hovering above the clouds. That's when I had the idea that I could maybe run to the top. I knew how to get there, even though visibility at last year's visit had been rather dismal. I also knew that I had to run, if I wanted to have any chance of getting back to the car before nightfall. It is 16 kms, roundtrip, and it was already a quarter to 4 when I pulled up to the trailhead and I knew that by 6pm it would be dark. So I put on my running shoes and took nothing but the camera with me. Even though the one-way distance is 8kms, the trailhead is located pretty high and there was not much more than maybe 500 meters in elevation to cover. Therefore I was able to run the whole time, because it never became too stepp. After a few flat kilometers through the forest I hit a forest road that I followed until it lead parallel to the traintracks up to the shortly before the summit. The last km, one follows a paved road, which switchbacks up to the high point, while the train comes around from the back (obviously not being able to do switchbacks). Hence, after about 50 minutes I arrived at the summit, just in time to see the sun set at the horizon, and too realize that the clouds were covering the mountain again and visibility (aside from the sun, which was clearly visible as it was setting) was again zero. Well, at least there was not as much snow as there had been on my first visit. But what can you expect from a mountain top that only gets 30 or so sunny days per year. The chances are thus pretty slim to enjoy the summit views (which must be fairly impressive, given the dominance of the mountain). I stayed on the summit for a maximum of 5 minutes, before deciding to head back as quickly as I could because it was really getting dark quickly. So I ran down the mountain, but after 4km, or half of the distance, darkness had caught up with me. I thought of my headlamp in the car, but remembered that I had my cellphone, with which I could at least shine at sign post, to see if I was heading the right way. There was still a bit of light as I was out in the open, but the last two kms throught woods were really in the dark. It was not too cold, so I probably could have spend the night, but I was looking to an evening of card playing and beer drinking and continued on. Shortly before 6 I saw the first houses and soon after arrived at the car. I drove back to Goettingen, walked around downtown for a bit, and ate a Kebap before meeting Martin at his house at 8. We played cards for a couple of hours but by 11 everybody's heads were falling on the tables and it was time to go to sleep. Also, I had an early morning planned, because I was going to hike up to the highest point of Thuringia.